Scott (of Industrial Music Electronics, formerly Harvestman) will be at Modular 8 for a HDMK3 demo! "I will lead off with a presentation about chip music ~30 minutes, then it gets into philosophy of square wave stuff, then probably seamlessly transitions into the HD3 demo." Bumping as a reminder that this is TOMORROW Saturday Aug 25. I hope we also get a release date for the single andore jr tomorrow as well. I cannot find anything about it on the modular8 website - will there be a live stream of the event to stay home and awake for? Yes, on their FB page they said it will be broadcasted live on their Youtube channel. I'll watch the live streaming from Italy. Live stream is up. 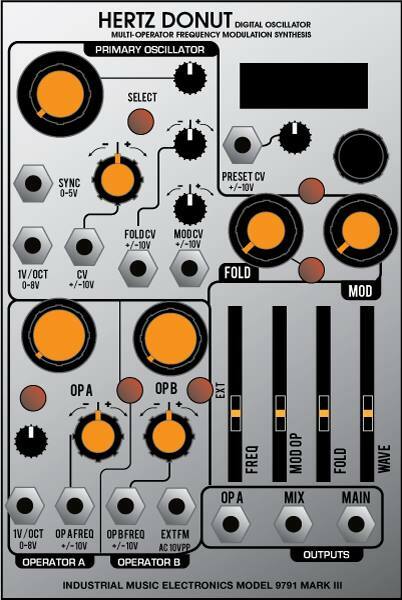 May have to sell a few modules to get this. Think it'd pair well with a piston honda mk3. hope it can be reposted. I was hoping to view it right now, but was removed. I'll update the original post once a new vid is (hopefully) uploaded. the video got copyright dinged by youtube/warp records. we had some background music playing when we were setting up waiting to start and i guess the youtube algorithm scanned it and flagged the video. so, it's in the process of being edited and should be on the youtube channel soon.. hopefully. Ah, what a pity! I watched the live stream and found it very informative. I think Scott played a bit of Journey's 'Don't stop believing' to demonstrate chiptunes but they probably are not signed to WARP. Regarding the HDIII I did not fully understand the new processing/folding part Scott implemented last week by reducing folding algorithms and introducing the new wave/phase modulation. If someone could explain these and the interaction between them it would be great. It looked as if they were different modes on the folding control, not sure if available at the same time. I liked the assignable CV input - you would loose CV over fold then though. I think in the end for o´more complex modulations one might end up using the preset morph, which is fine too. Also: estimated release date 2 - 3 months...now wait for a reupload of the video to rewatch it and get a better understanding. Updated original post with video of event. Nice, wasn't able to watch the whole thing live. I wonder if it is capable of more traditional, glassy FM tones. I assume it would be, just by dialing back the overall mod depth. Scott you are killing it here with your new mkIII offerings. HD will be a nice FM playground. Finally got a chance to listen to it. Sweet Jesus the revised sound on this thing is incredible. When I was re-listening to this and Scott was briefly discussing the unison mode I thought of the microbrute and how it’s sub-oscillator was able to be a sub octave or a fifth below. I doubt it would happen when it’s released since that’s just around the corner but I wonder if it would be possible at a later date to upgrade the firmware with the ability to set the unison oscillator at a musically relevant interval (or even a free offset ranging from unison to an octave down) via the oscilator manager menu. Ya, my initial skepticism about "audio quality improvements" conjure clean, sterile, lifeless, "perfect" sounds. Thankfully it is translated into crisp, higher-resolution details of hell's frescoes.